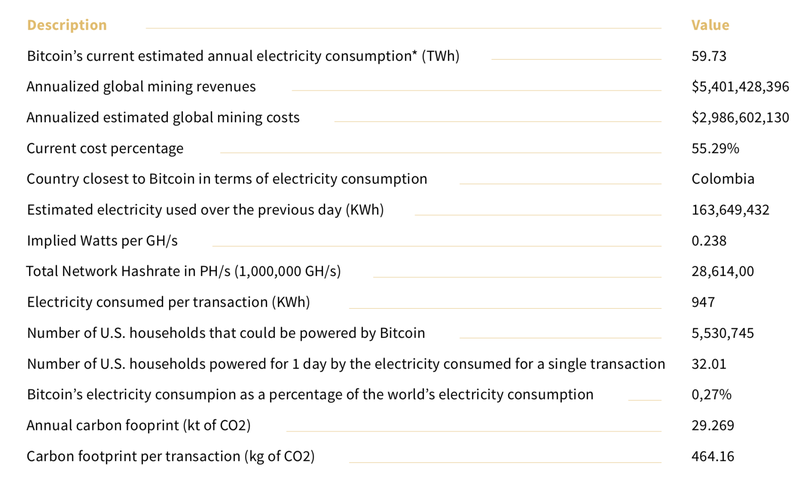 The high electricity consumption of bitcoin has been widely reported, with one widely reported (and disputed) estimate having it consume at peak more electricity than 159 countries. However, this is a temporary problem with cryptocurrencies including bitcoin, not an immutable feature. There are three things which drive Bitcoin’s absurd power use: artificial scarcity leading to many, many miners, increasingly hard competition for the remaining few million coins, and its proof-of-work approach to immutability and validity. Bitcoin’s attributes as a currency or store of value are problematic compared to newer cryptocurrencies: it’s slow to transact and it’s expensive to transact. It will turn into a rarely turned over asset like fine art paintings in a specialty market, but will peak soon if it hasn’t already. Bitcoin uses proof-of-work or how many CPU cycles a system has devoted to mining as a primary mechanism of validating whether a source is trusted or not. This is an already obsolete approach to the Byzantine Generals’ Problem. As Bitcoin fever spread, the number of miners competing to win the right to create the next block and hence earn bitcoin shot through the roof. This was purely economic. If Bitcoin were half the price, there would be a quarter as many miners. If it were double the price, there would probably be four times as many miners. As it’s already 50% off its pre-New Year’s peak, the number of new miners entering the market is lower and likely many miners are switching to other currencies. The Bitcoin problem, in other words, is a multiplication of problems: high energy to discover the solution * many, many people trying to discover the solution * proof-of-work. It’s inefficient and inelegant from a resources perspective, while being elegant as a first mover on the Byzantine Generals’ problem. Ethereum is in a bit of a bubble as well, but its consumption is about to drop radically. It has been using proof-of-work, but is about to move to its Casper proof-of-stake model which will reduce mining competition and the like substantially. Proof-of-stake is a model where the creation of the next block is delegated somewhat randomly among the oldest and richest miners. As validation is easy and no miners are competing to solve computationally hard problems, Ethereum’s electricity consumption will drop by orders of magnitude. Casper will be a hard fork, so while the old Ethereum will still be around, its problems will become more and more apparent. There will be a lot of secondary coins created on the Ethereum model which won’t follow the hard fork, but they are also secondary consumers. And it’s important to note that the vast majority of cryptocurrencies are based on Ethereum, so if they follow along, overall consumption in the space will diminish as well. Nori, a company which just emerged from stealth, is creating the Noriton. It’s a cryptocurrency token that represents a ton of CO2 removed from the atmosphere and sequestered in one of a number of potential ways. The key there is that this isn’t a cap-and-trade or carbon tax system, but a system which values removed tons of CO2 explicitly. Like carbon offset programs for fliers and drivers, it allows individuals and businesses to offset their CO2 emissions with guaranteed removal of CO2 from the atmosphere. NEO and Hyperledger are next-generation with even lower electricity costs and attendant carbon footprints. NEO uses what it calls delegated Byzantine Fault Tolerance (dBFT) which is an even more optimized proof-of-stake model. It mostly randomly gives miners with high stakes in NEO the right to generate the next block, hence the delegation. This is much lower energy-intensive and allows higher transaction volumes as well. Hyperledger Fabric centralizes block creation into a single resource pool and has multiple validators in the participants. Validation is much easier than creation, and creation will be centralized on a single, optimized platform. It’s also not intended as a cryptocurrency platform, although VIVA did create a cryptocurrency with it. It’s an enterprise collaboration engine, using blockchain smart contracts and an externalized payment system where that’s necessary, allowing variants of net 30 terms most blockchain smart contracts don’t support. So most of the concern about cryptocurrency energy use is going to go away in the next year. The bubble will pop for stale assets like bitcoin, places like China will clamp down on wasting electricity on competitive mining, and everybody else will move to variants of proof-of-stake or perhaps IOTA, which seems to dodge the bullet in a different way.